First, write a knowledge base using the predicate directlyIn/2 which encodes which doll is directly contained in which other doll. Then, define a recursive predicate in/2 , that tells us which doll is (directly or indirectly) contained in which other dolls. 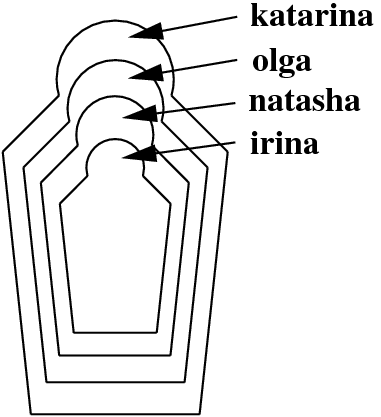 For example, the query in(katarina,natasha) should evaluate to true, while in(olga, katarina) should fail. Exercise 3.5 Binary trees are trees where all internal nodes have exactly two children. The smallest binary trees consist of only one leaf node. We will represent leaf nodes as leaf(Label) . For instance, leaf(3) and leaf(7) are leaf nodes, and therefore small binary trees. Given two binary trees B1 and B2 we can combine them into one binary tree using the functor tree/2 as follows: tree(B1,B2) . So, from the leaves leaf(1) and leaf(2) we can build the binary tree tree(leaf(1),leaf(2)) . And from the binary trees tree(leaf(1),leaf(2)) and leaf(4) we can build the binary tree tree(tree(leaf(1), leaf(2)),leaf(4)) . T = tree(leaf(4), tree(leaf(2), leaf(1))).